Melbourne Band 312 – Phenomenal Male and Female Lead vocalists lead this incredible, versatile, sophisticated, talented and funky live band. If you’re after the funkiest band that oozes talent, energy, vibrancy and versatility you have definitely come to the right place. Tight and funky, the band features strong vocal harmonies and a rhythm section dedicated to grooves that keep you groovin’. Melbourne Band 312 has quite an exciting line-up with superb musicians and vocalists accompanied by an array of choice musicians and dancers. Specialising in all events in the Melbourne region, around Australia and overseas, we offer exhilarating performances, breathtaking versatility and a strong dedication to professionalism. We cater to your individual needs to ensure an unforgettable event. Offering a flexible range of line-up options, Melbourne Band 312 can tailor a package to suit your event, from intimate weddings to full-scale corporate shows. We pride ourselves on our versatility and feature a huge and ever-growing repertoire of songs and a wide variety of musical styles ranging from soul, rock and disco classics to modern pop and current Top 40 hits, giving the flexibility to provide the soundtrack to any event. Melbourne Band 312 is experienced, professional, versatile and most of all brilliant at what we do. Based in Melbourne, Melbourne Band 312 have performed all over Victoria, interstate and overseas from intimate weddings through to 90,000 large scaled events. Melbourne Band 312’s first class entertainment have taken them across the world. Some highlights include being the leading act at Dubai’s Atlantis the Palm hotel’s New Year’s extravaganza, supporting Human Nature at the Darwin Cup Ball and most recently being the main act for New Years Eve 2013 at Federation Square. Performing for this special occasion as ‘Urban Spice’ in-front of a stunning crowd of 90,000! Clients include: Mazda Australia, National tiles,I Select, NDY, Acceptance and Finance, Snap on Tools, St Vincent’s Hospital, La Trobe Regional Hospital, Rexel, Victorian Tourism Mitsui Melbourne, Image Impact Group, Australian Unity, Loan Market Group, Australian Automotive Air & Denso, Ray White, Design and Build, Toshiba, Maddocks and the list continues. 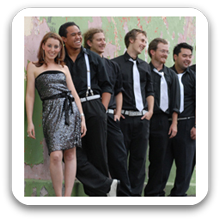 Can perform as a: 6 to 10 Piece Band and are available to perform in Melbourne and Surrounding Areas.